An article published in the journal “Monthly Notices of the Royal Astronomical Society: Letters” reports the discovery of an asteroid in an orbit near Jupiter’s which has a retrograde orbit, which means that it moves in the opposite direction of the solar system’s planets and most of its celestial bodies. Cataloged as 2015 BZ509, it was discovered in 2014 and the analysis of its orbit with a series of simulations led to the conclusion that it came from another solar system. The discovery of the interstellar asteroid ‘Oumuamua has been a major source of interest for astronomers but it’s a small celestial body passing by, which relatively recently entered the solar system and is now progressively moving away from the Sun. 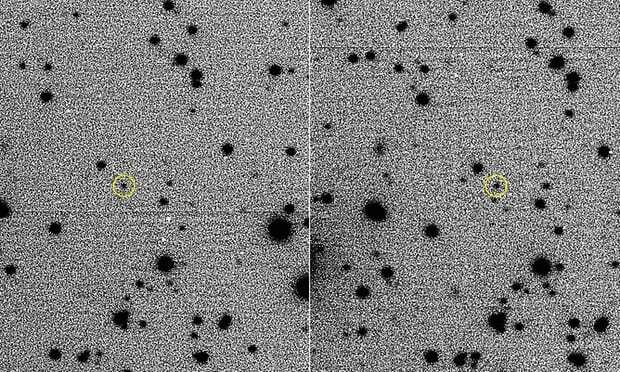 Now another asteroid, about 3 kilometers across, whose complete “name” is (514107) 2015 BZ509, also discovered thanks to the Pan-STARRS 1 telescope, could be another interstellar asteroid that was instead captured by the solar system. A team of researchers led by Dr. Fathi Namouni from the University of the Côte d’Azur in Nice, France, tried to reconstruct the history of 2015 BZ509 with a series of simulations. Today its orbit is very close to that of the planet Jupiter but moves in the opposite direction, a very unusual situation. According to the results, this asteroid was moving that way already 4.5 billion years ago, during the solar system’s formation but if it was born together with the other celestial bodies it would have initially moved in the same direction. The researchers concluded that 2015 BZ509 comes from another solar system and was captured when it entered ours, during its formation phase. Jupiter’s gravity was enough to keep it in a stable orbit, even if it’s retrograde. Dr. Fathi Namouni compared it to an immigrant while ‘Oumuamua was compared to a tourist. Helena Morais, co-author of the study, explained that at the time of the solar system’s formation the Sun was much closer to its “siblings”, other stars that formed in a single cluster and then move away from each other. That proximity favored the passage of asteroids from one system from which they were ejected to another. According to Fathi Namouni the chances that 2015 BZ509 and ‘Oumuamua come from the same star system are practically zero. 2015 BZ509 arrived when the solar system was forming while ‘Oumuamua arrived relatively recently and probably traveled for a few billion years. The discovery of 2015 BZ509 is interesting also because it poses the problem of the possible contamination of a solar system. According to the theory of panspermia life’s building blocks or even life forms can travel between star systems sowing them. It’s another reason why surely this asteroid will be studied even more and the researchers want to examine other asteroids with anomalous orbits as well.